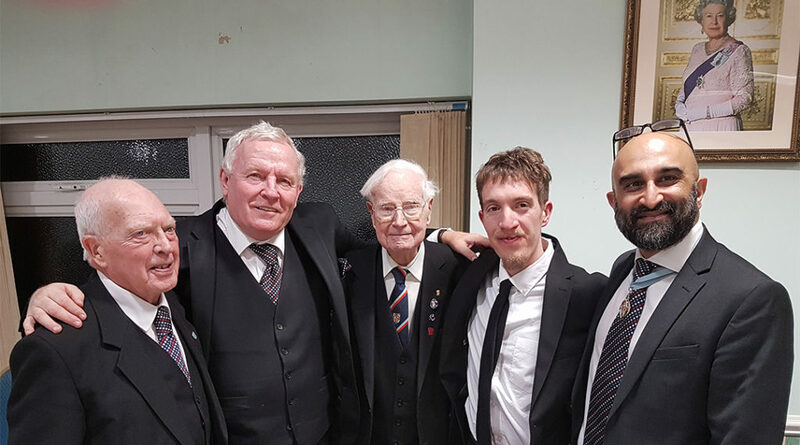 Tuesday, 22 January was a special day for Tring Lodge No 5001 – the Worshipful Master, W Bro Beej Parmar vacated the Chair to enable W Bro Tony O’Connor to Initiate his grandson, Bro Joshua Day, into Freemasonry. He was ably assisted in doing so by W Bros Dermot Doherty and Brian Miles and Bro Ray Uren. Bro Day had, in fact, recently been awarded a BSC Honours Degree in Physical Geography which was made possible, in part, by a grant from the Masonic Charitable Foundation. During his interview for membership, Bro Day had thanked the MCF for the grant and stated it was his intention to give something back to Freemasonry. The occasion was all the more significant for W Bro O’Connor, who was presented with an engraved glass tankard by the Worshipful Master in recognition of his being Initiated into Freemasonry 50 years ago; almost to the day (it was actually the day after their meeting)! If this was not enough, on the Second Rising Provincial Grand Charity Steward, W Bro Chris Noble presented the Worshipful Master with a Certificate of Vice Patronage, in recognition of Tring Lodge’s support of the Provincial 2019 Festival. This was accompanied by a Stewards Jewel for the Worshipful Master himself. To complete the evening, Lodge Tyler, W Bro Wally Randall (who, at 103, must be one of Masonry’s oldest Tylers), rounded off the Festive Board with a perfect rendition of the complete Tyler’s Toast; closing what had been a very special evening for all involved.